This baby girl blouse all-in-one is crafted in plain and floral print cotton jersey. 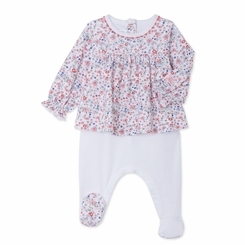 Designed like two pieces in one, this baby item sports a host of charming details: gathers on the chest for volume, flower and mini-satin stitch finishes, gathered cuffs and printed foot soles. There is a practical poppa opening at the back and between the legs. A blouse all-in-one in the style of two pieces, perfect for dressing baby in their first months. Material: 100% Cotton.